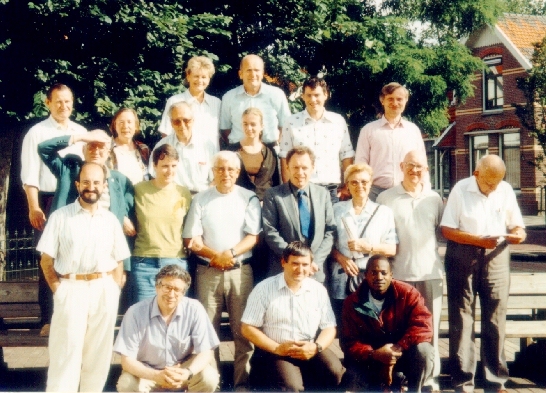 This photo shows some of the participants at the 1997 International Ido Conference in Bakkum, Netherlands. It was taken outside the hotel and conference centre in the village of Bakkum. Ica fotografuro montras kelki di la partoprenanti che la Ido-Konfero Internaciona 1997 en Bakkum, Nederlando. Ol esis facata exter la hotelo e konfero-centro en la vilajo Bakkum. Top row / supera rango: Eberhard e siorino Scholtz (Germania). Second row / duesma rango: Wolfgang Quies (Germania), Heidi e Alfred Neussner (Germania), Sofie Bosma (Nederlando), Hans Stuifbergen (Nederlando), Manfred Magin (Germania). Third row / triesma rango: Jean Martignon (Francia), Marion Kasper (Germania), Günter Anton (Germania, Prezidanto dil Uniono), Jan Skoniecska (Polonia), Marcella e Jacques Bol (Belgia), Tom Todd (Usa). Fourth row / quaresma rango: Andrez Dominguez de Diego (Nederlando), Ricard Wilshusen (Germania), Frank Kasper (Germania), Jean Codjo (Benin).